It isn’t that hard to come up with a list of App Gems winners. The difficult part is keeping that list down to a manageable length. When Macworld editors first meet to discuss our awards for great iOS apps, the number of nominees runs in the triple digits. From there, we whittle down the names to just a handful of winners. The following apps just barely missed the cut—but they still deserve your attention if you’re on the lookout for outstanding apps for your iPhone, iPod touch, or iPad. 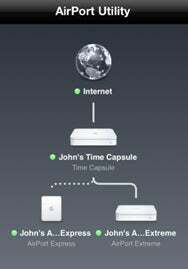 AirPort Utility: Apple shrunk down its wireless network configuration tool to fit on iOS devices, offering a welcome mobile utility for setting up and troubleshooting your Wi-Fi network. Al Yankovic: When I Grow Up: This mobile children’s book isn’t just a delightfully written, Seuss-quality rhyming story sure to entertain kids and their parents; it also features a stunning narrative performance from Yankovic himself, interactivity on every e-page, and several funny built-in mini games. Backbreaker 2: Vengeance HD: Run NaturalMotion’s bone-crushing football game on an iPad 2, and the graphics will convince you you’re playing something straight off of a dedicated gaming console. Blogsy: iPad-toting bloggers swear by the drag-and-drop functionality of Fomola’s mobile blogging tool. BrainPop Featured Movie: Designed for both the iPhone and the iPad, this education app offers polished, kid-friendly educational animations every day, immediately tests you on what you’ve just learned, and does so with an easy-to-navigate interface. The Civil War Today: History buffs will find a lot to love in this informative and even entertaining look at the War Between the States. 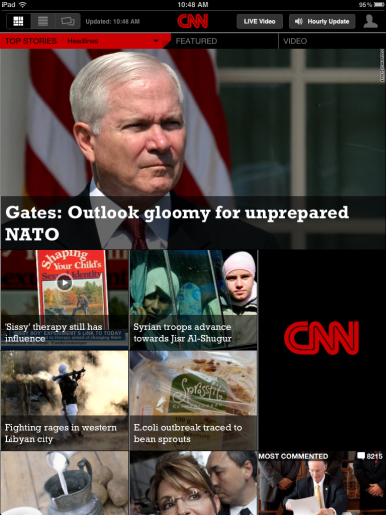 CNN App for iPad: The cable news network shows other media entities how to embrace the iPad as a news-delivery platform. Comic Life: For giving your photos a look that’s straight out of the funny pages, Plasq’s iPad image editor is hard to beat. Daedalus Touch: We appreciate this text editor’s novel organizational approach as well as its clean interface and gesture-based navigation. Dermandar Panorama: Many iOS apps let you stitch together your photos into a seamless panorama, but Dermandar’s offering is on the short list of apps that make the process quick and easy. Dragon Go: Before Siri arrived on the scene to offer voice-activated searches for iPhone 4S owners, Nuance’s cleverly designed search app would listen to your questions and produce contextually relevant results. And it’s still a solid Siri stand-in for owners of older iPhones. FDX Reader: Created by screenwriters, for screenwriters, FDX Reader provides you with a simple, clean way to read Final Draft scripts on your iPhone, iPod touch, or iPad. Fotopedia National Parks: All of the photo-centric Fotopedia apps impress, but we’re particularly taken with this look at 58 national parks by photographer QT Luong. GhostGuitar: All those inspired air guitar solos can produce real music, thanks to this fun-to-use app that turns your gyrations into actual tunes. Hound: Discovering new music is as simple as talking into your iPhone, thanks to this voice-driven search app. Instacast: Vemedio’s podcast manager patches a huge hole in Apple’s software: The ability to subscribe to and download podcasts directly to your iOS device. It’s also great for listening to those podcasts once you’ve got them. Jetpack Joyride: Fans of cave-flying-style games should look no further than this delightful and addictive offering from Halfbrick Studios. LetterMpress: It might seem strange to bring a 15th-century invention to the iPad, but this app takes full advantage of the iOS interface for creating your own letterpress designs while offering an engaging and authentic experience. Luminance: Subsplash’s free photo editor for the iPhone and iPad offers a host of pro-level, non-destructive photo editing capabilities (editing in layers, filters that let you adjust exposure, white balance, hue and saturation, and tone, just to name a few). Add to that preset looks, cropping, sharing to Facebook and Twitter, and output at full resolution. 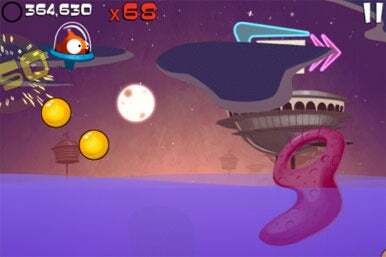 Mighty Fin: From lively gameplay to stylish graphics—not to mention dozens of costume changes—this side-scrolling game for the iPhone and iPad has it all. Newstream: Until very recently, personalized news apps were almost entirely limited to the iPad; this news app, however, offers readability and an outstanding multitouch interface to iPhone and iPod touch users. Notability: A feature-rich note-taker, this iPad app handles the functionality of up to four other App Store productivity tools. OmniOutliner for iPad: The Omni Group’s iPad app puts the focus on speedy outline creation while giving you the ability to work deeply within outlines, without ever having to turn to the Mac version of the software. PBS for iPad: If it’s streaming video you seek, you’ll find a wealth of content—more than 300 videos, including full-length programs—in this impressive offering from the public television network. Perfect Cell: This iPhone/iPad game from Mobigame offers a clever mix of action, side-scrolling, and puzzle games as you use touchscreen gestures to control a captive alien in its journey—as bloody or stealthy as you make it—to freedom. 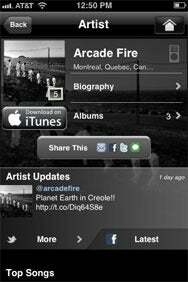 PhotoRocket: Sharing multiple photos with different people has never been easier thanks to this free iPhone and iPad app, which lets you create a customized gallery where viewers can add photos and comments. Prompt: Anyone who regularly needs to make an SSH terminal connection on their iOS device will find Panic’s mobile terminal app a worthwhile investment. Pulse News for iPad: This news-reading app provides an elegant approach to RSS, particularly if you only keep tabs on a handful of feeds. RC Trackpad HD: Its name may have changed (from Remote Conductor HD), but this iPad app remains a great way to turn your tablet into a souped-up trackpad. Scribblenauts Remix: Your kids will flip over this inventive puzzle game—if they can ever convince you to stop playing it and let them have a try, that is. 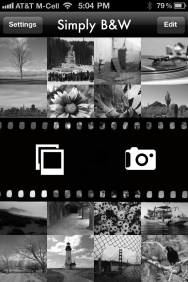 Simply B&W: The App Store’s cup runneth over when it comes to unitask photo editors specializing in monochrome effects, but we couldn’t overlook this no-frills image editor. Solar Walk: Support for 3D televisions and explanatory movies highlight just some of the changes made to one of our favorite astronomy apps during the past year. Tenuto: Musictheory.net’s universal app fills the niche for those who want to learn music theory, offering interactive exercises for identifying notes, key signatures, intervals, chords, ear training, and more.